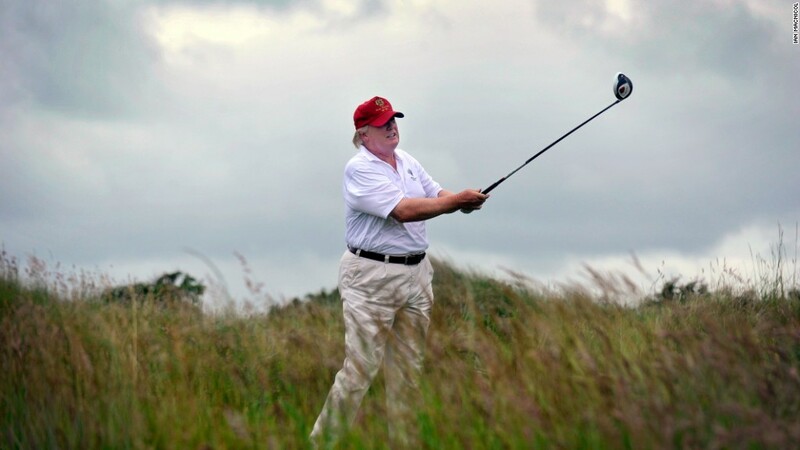 Is President Trump good for the golf industry? The government is allowing American employers to hire 15,000 more foreign workers for seasonal jobs. But it's too little, too late for one industry that needs the help. Golf courses rely on seasonal workers to tend greens, manicure the grounds and serve as maids, cooks and caddies. When the Department of Homeland Security announced the expansion last month, most golf courses were already well into their seasons. "We wish this had happened earlier," said Bob Helland, of the Golf Course Superintendents Association of America. "A lot of this isn't going to help our members who needed workers by April." Winter cold shuts down golf in many parts of the country, and the golf season generally runs from April through November. The permits for season workers, known as H-2B visas, are given out twice a year -- 33,000 for April through September and 33,000 for October through March. The 15,000 additional visas Homeland Security granted this year were a one-time thing. Employers have to demonstrate that the jobs can't be filled by American workers. And the competition is stiff: This year employers put in two applications for every visa that was granted. For golf courses, that means jockeying with landscaping companies, restaurants, seasonal businesses and even the horse racing industry. The window for summer visas opens in March, and many golf courses don't start hiring until April or May, putting them at a disadvantage because the visas go out first-come-first-served. For several years, the Pleasant Valley Country Club in Little Rock, Arkansas, has hired the same workers from the Philippines, using a program that exempts returning workers from the annual cap. That program expired last year so the club applied for H-2B visas to maintain its newly renovated $4.5 million course. Melissa Compton, the country club's controller, said the application was approved, but the cap had already been reached. Even with the 15,000 new visas, the course didn't get any workers. "It's extremely frustrating because they were family to us," said Melissa Compton, the country club's controller. "They were sad and we're sad. We feel very handicapped." To make up for the 25 positions it hasn't been able to fill, the club has tried advertising on radio and using a headhunting program that rewards employees who bring in new people. It hasn't worked. "It's been rather desperate and we've spent lots of money trying to find workers," Compton said. The Trump administration could have approved as many as 60,000 additional visas, but Homeland Security said it believed 15,000 would satisfy businesses' labor needs. During the 2016 fiscal year, the golf industry alone requested an estimated 2,500 visas, according to Helland. Neither the industry nor Homeland Security keeps track of how many are granted to the golf industry. Steve Mona, the CEO of the World Golf Foundation, which promotes the game, has been among those leading the charge for changes to the H-2B visa process. He wants to reinstate the program that exempts returning workers from the cap. The previous program expired in September, under the Obama administration, and neither Congress nor Trump has moved to reinstate it. "You lose workers who have been at your facility for a number of years and are trained and familiar to golfers," Mona said. It's worse for golf courses in the North, where the season starts later -- meaning it's more likely that there aren't enough visa slots to go around. "North of the Mason Dixon line, they're not getting their workers back in this scenario," Mona said. Senators Thom Tillis, a North Carolina Republican, and Angus King, a Maine independent who caucuses with the Democrats, have introduced a bill that would make it faster to get visas and would exclude returning workers from being counted toward the cap. Tillis told CNNMoney that some Republicans are concerned that such a change would take jobs from Americans, and some Democrats are concerned that it would create an excuse to pay workers less money. "There's this nonsensical belief that there are Americans lining up to take these jobs. There aren't," Tillis said. "But if we don't fill these positions, then American business owners will suffer." The liberal-leaning Economic Policy Institute recently released a report that encouraged reform of the program over expansion. It cited instances in which the seasonal workers have been illegally underpaid or exploited. The H-2B visa program should be familiar to President Trump: His Mar-a-Lago Club and his Jupiter Golf Club, both in Florida, filed documents to hire more than 75 foreign workers this year. Labor Department records show that at least 1,256 foreign worker visas have been approved for the Trump Organization over the past 15 years. Trump has said he tried to hire American workers first, according to government regulations, but was unable to fill open jobs.